Yes, our one hundredth post slipped quietly past on Monday, we’ve never been ones to mark the round number anniversaries, it just seems so arbitrary. Oh alright then, I missed it, but in order to mark the occasion of our one hundred and second post I want to take a few moments to look at how far we’ve come since we launched back in January of this year and that first recipe, scrambled eggs. 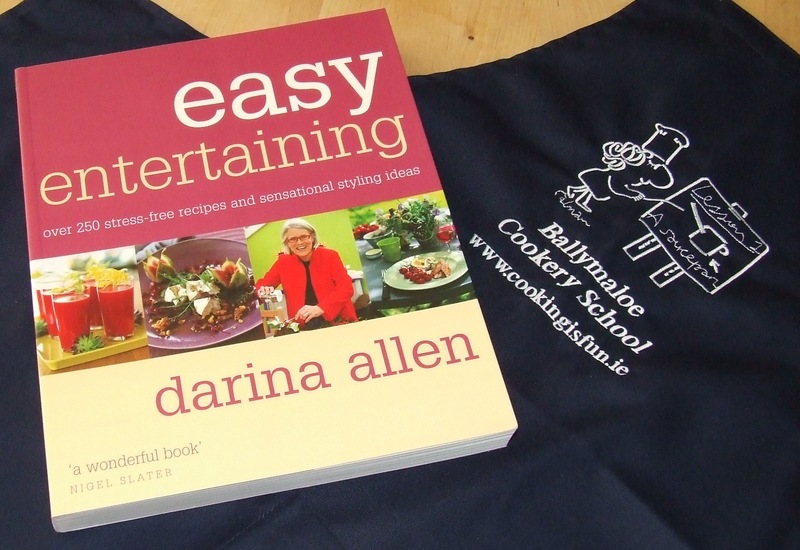 So to mark the occasion of our one hundred and second post, we’re having a draw with a great prize, a copy of “Easy Entertaining” by Darina Allen of the Ballymaloe Cookery School and also a Ballymaloe Cookery School apron, both pictured above. I’m a relation, and WHAAAAaaa! I cannot enter the competition. It might be called Ne… nep… ah you know, it is one of those isms! Hi Anders, long time no see! I knew it was nepotism and was only playing since I cannot enter the competition. Have to say one of my favourite’s is hubby’s homemade pizza. But that might also be because I don’t do much cooking those nights! Pingback: Grannymar » From Scrambled Eggs to…..
Now this is a lovely blog. Some very good recipes and articles. I pop into Grannymar’s and feel I know you and Elly but until this morning I did not realise you had a blog. Congratulations on your 102nd post I can’t get to grips with putting a blog on twitter and facebook. I must come out of my dotage and try. Don’t worry about me and the prize I am just so pleased to find this. I shall add you to my list. Congratulations. It’s a great site. Very well done. My favourite meal is a rasher sandwich and a glass of Guinness. I like quail eggs wrapped in bacon on top of a piece of salami covered with a Russian white sauce, followed by a shot of coffee purified with Pa. limestone rocks. Mmmmmmmmmmmm. Your mother -in- law is teaching me how to cook. My gosh Maynard, here is 50 cents– go out and buy a proper chicken egg. Congrats to you, George and Elly!!!!!!! My favourite meal is Lamb Tava from Tessa Kiros’s Falling Cloudberries book, it’s so delicious! Congrats on the 102nd post! Congratulations. May you hit the K mark soon! My favourite meal is rice with dal, one vegtable side dish, one roasted papad, and a bowl of yogurt. Congrats and cheers on your blog! It’s a great idea to stage a draw. I’m on Lily’s side! Home-made pizza – made by someone else – and of course a nice glass of wine! Perfect Friday evening dining! Favourite meal is definitely a good old Sunday Dinner of cabbage, potatoes, carrots and turnip and a veggie alternative to meat. Best day of the week to eat at a leisurely pace too. Will definitely give that falafel recipe a try, thanks! Hmm – so much delicious food to choose from! Favourite comfort food has to be a nice piece of baked salmon, mashed potatoes and mushy peas Other favourite meals include a chicken and grape salad, with celery, spring onions and hazlenuts in a yogurt dressing, or a delicious shank of lamb falling off the bone, in a rich gravy with nice floury potatoes and carrots and onions. Yumm! BBQ chicken drumsticks with a tasty homemade BBQ sauce served with salad and a baked potato and a nice cold glass of Jacobs Creek Sparkling Rose. Alright then time to close this, if your entry appears after this comment, I’m sorry but you were to late to enter, better luck next time.